We are grateful to the many families who have pledged to our Capital Campaign. We mailed brochures to all registered families that gave highlights of our campaign. We understand that some parishioners still have unanswered questions. Attached is a list of the most frequently asked questions that we have received to date. If you have a question that is not listed on the attached, please contact us. Thank you for supporting our Capital Campaign. All parishioners and friends of Our Lady of Guadalupe are asked to prayerfully consider participating in our Capital Campaign Pledge Drive! Stop by the back of church during our first full weekend of each month and see the displays and information available about the future development of our Annex Property on FM 1560. 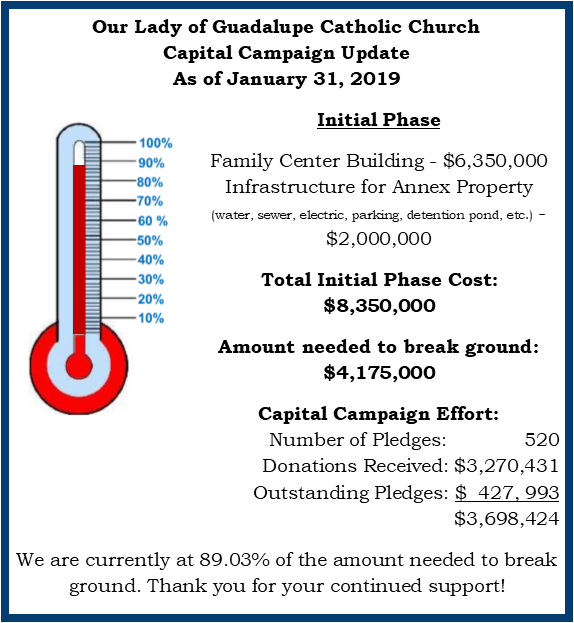 You can give online by using “Online Giving” button on the home page of this web site, or simply fill out a pledge card and return to the locked box in the back of church or the parish office. Your generosity is appreciated today and will be appreciated by future generations! Did you know that Our Lady of Guadalupe can qualify and apply for numerous monetary grants and foundation matching funds in 2014 and beyond? We can, based on the many hours served by OLG volunteers in the 40-plus ministries and numerous OLG events! 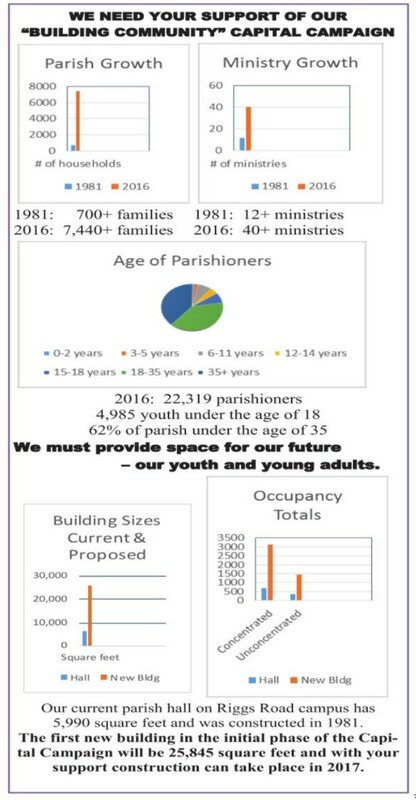 We as a parish just need to collect the hours served by volunteers, track them and submit these hours as part of the grant application process within the archdiocese. Any monetary grants awarded to OLG will be directed to the Community Building Capital Campaign Fund. Therefore, effective November/December and 2014 and beyond, OLG is asking all unpaid volunteers to fill out the OLG Volunteer Service Hours Forms by the 10th day of each quarter (every 3 months). Forms can be picked up in the church foyer, parish office, parish hall entry boxes and/or can be downloaded below. 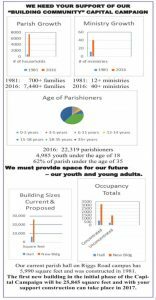 Completed forms can be turned into the Parish Office, the drop box outside the parish office and/or the locked box in the church foyer. Further questions on how to fill out the forms and criteria, please contact our OLG Capital Campaign Grant writing subcommittee co-chairs, Roxana Vargas or Tomas Cisneros.